CM14 for Sprint Galaxy S5 CM14/CyanogenMod 14 has now arrived through an UNOFFICIAL build. We also have the Lineage OS 14.1 for Galaxy S5 Sprint. For latest updates, stay tuned to the Lineage OS device list page. This Nougat 7.0 has come for Galaxy S5 Sprint via CyanogenMod 14 ROM. Since Google released Android Nougat Source code, we have update many Android NOUGAT AOSP ROMs and also many CyanogenMod 14/CM14 ROMs updated and many are yet to come. If you are looking CM14 for Galaxy S5 then here is the Galaxy S5 CM14/CyanogenMod 14 Nougat 7.0 ROM. This CyanogenMod 14/CM14 for Galaxy S5 Sprint is brought to you by developer haggertk. Download and Copy the GApps and Sprint Galaxy S5 CM14/CyanogenMod 14 ROM ZIP to your phone. Reboot and Enjoy the CM14 for Galaxy S5 Sprint. 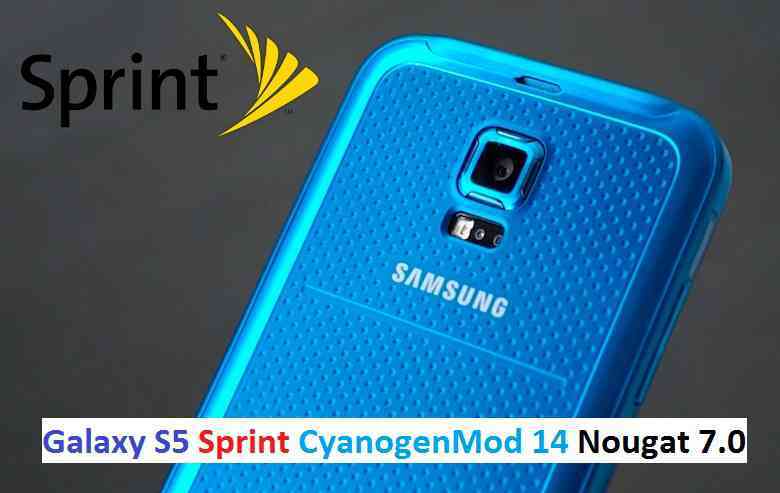 Copy the latest Sprint Galaxy S5 CM14/CyanogenMod 14 ROM ZIP file to your phone. Stay tuned or Subscribe to the Galaxy S5 Sprint (G900P, kltespr) forum For other Android Nougat ROMs, CyanogenMod 14 ROMs, other ROMs and all other device specific topics. If you are unable to send message to anyone then it is very likely that the Message centre number might be wrongly set on your phone. You can get it corrected. I double checked… the Message centre number never changed and was correct. Updated with a new link, please try that one.